I'm a day late on this one, so sorry. Friday and Saturday Starbucks is offering 50% OFF refresher beverages from 3-5pm. What is a refresher beverage, you ask? I have no idea - I thought pretty much every beverage was refreshing in one way or another. 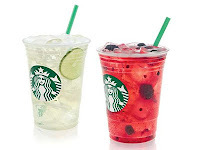 In the world of Starbucks it is a handcrafted cool drink that has berries or limes or lemons in it. Looks pretty tasty. Click here to view the offer or just go to your local Starbucks. Unless you live on a ranch in the outskirts of Juneau, Alaska, there is probably one near you. Nope, Juneau has one too.